Welcome Aboard! Settle back, relax and enjoy a leisurely drive to "The Bluegrass State," Kentucky for the start of an exceptional "New Tour" of biblical proportions! Welcome Aboard! Settle back, relax and enjoy a leisurely drive to "The Bluegrass State," Kentucky for the start of an exceptional tour of biblical proportions! After checking into the Holiday Inn Riverfront in Covington, Kentucky for the next three nights, we are treated to a delicious buffet dinner at the hotel. After a buffet breakfast, we depart for a day of sightseeing. 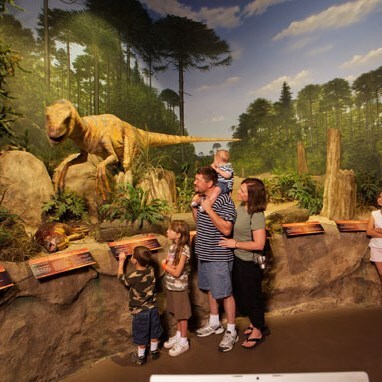 We begin our touring at The Creation Museum in Petersburg, Kentucky. The state-of-the-art 75,000-square-foot museum brings the pages of the Bible to life, casting its characters and animals in dynamic form and placing them in familiar settings. 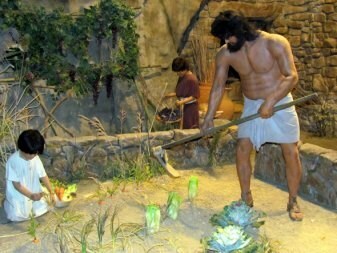 Adam and Eve live in the Garden of Eden. 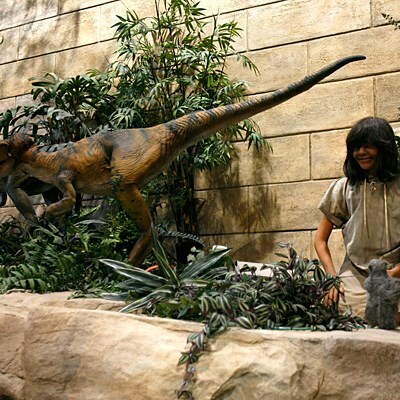 Children play and dinosaurs roam near Eden's Rivers. The serpent coils cunningly in the Tree of the Knowledge of Good and Evil. Majestic murals, great masterpieces brimming with pulsating colors and details, provide a backdrop for many of the settings. You'll journey through a visual presentation of the history of the world, based on its 7 C's of History: Creation, Corruption, Catastrophe, Confusion, Christ, Cross, and Consummation, where you will discover an interpretation of how science confirms biblical history. In addition to the Stargazer's Planetarium and the dozens of informative videos throughout the Creation Museum, there are several more shows that you don't want to miss, including: "The Last Adam," "Six Days of Creation," and "Men in White" (tickets are not included). Don't miss a chance to explore the Botanical Gardens with a mile of walking paths, enjoy the wonders of God's creation in the Petting Zoo and browse its extensive Gift Shop before we arrive at Noah's Café for lunch. Following lunch, we return to our hotel for some time to sit, relax and freshen up before departing for the Queen City Riverboat. It's "All Aboard!" for a celebration of fun and inspiration as we embark on our special Gospel Dinner Cruise. Enjoy a festive and fun atmosphere filled with good fellowship and harmonious melodies while you dine on a delicious buffet dinner served against spectacular views of Cincinnati's skyline from the water. Come sing along, tap along, clap along and lift your voice to the heavens while enjoying the performance of many of your favorite gospel songs, including: "Put Your Hand in the Hand," "How Great Thou Art," "I Believe," "You Will Never Walk Alone," "Go Tell It On the Mountain" and many more. Following our dinner cruise, we return to our hotel for a good night's sleep. After a buffet breakfast, we depart for Williamstown, Kentucky and The Ark Encounter, a full-size Noah's Ark experience built according to the dimensions given in the Bible. 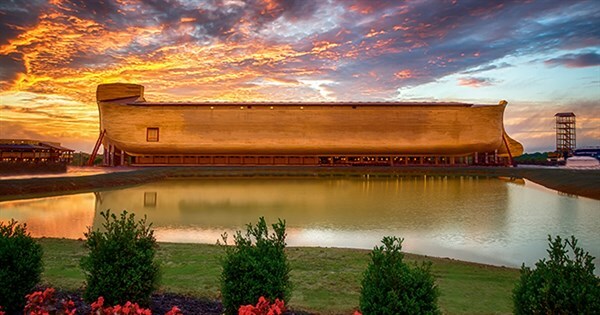 The largest wooden timber-framed structure in the world, The Ark Encounter is a one-of-a-kind historically themed attraction. Spanning 510 feet long, 85 feet wide, and 51 feet high, this modern engineering marvel will amaze the young and old. From the moment you step inside the Ark you will experience the pages of the Bible like never before and you'll be entertained and educated by the jaw-dropping exhibits. Also enjoy a visit with the friendly animals in the zoo. Explore The Ark's three levels - beginning with the first level depicting Before the Flood; the 2nd level depicting During the Flood; and conclude with the 3rd level depicting After the Flood. 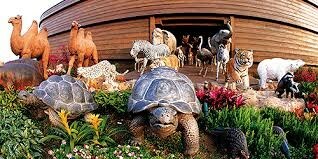 See hundreds of different displays including: Noah's study, living quarters, cages, storage vessels, recreations of how Noah and his family may have lived, animals, and even an animatronics version of Noah that will answer your questions. There is so much to see and do that you will be left both amazed and awestruck by this one-of-a-kind-in-the-world structure! A tasty buffet lunch is included at Emzara's Kitchen, adjacent to the Ark. After returning to our hotel, you will have time to sit, relax and freshen up before going out for a buffet dinner and entertainment at the Washington Platform Restaurant. Following dinner, we take our seats for Bob Ford's World of Folklore & Fun - "Talk to the Animals" show. This lighthearted performance will be told in folk stories and songs from around the world. When Bob Ford starts to sing, it doesn't take long until casual toe-tapping and humming turns into an all-out sing-along! Listen and sing-a-long to familiar folk tunes like "The Unicorn," "All of Gods Critters Got a Place in the Choir," "Down by the Riverside," "Froggie Went a Courtin'", "Everything is Beautiful," "Gonna Build a Mountain," along with lesser known songs from world cultures and many, many more. Bob's musical repertoire evokes nostalgia for the simpler pleasures. You'll come away engaged, enriched and entertained! After the show, we return to our hotel for a restful night's sleep. After a buffet breakfast, we depart for home taking with us fond memories of our tour of biblical proportions!